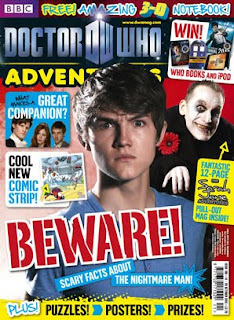 With the new series of The Sarah Jane Adventures now being broadcast on various BBC channels, junior Who comic Doctor Who Adventures has given over pages to the series and in the current issue the 12 centre pages of the 36 page magazine are a "12 page pull-out mini mag" promoting the children's series. Unusually this season the Sarah Jane TV series started with a very dark story about The Nightmare Man rather than its more usual kid-pleasing alien runaround but, with Julian Bleach (new Who's Davros) as the titular character plus Sarah's son Luke and K-9 dispatched off to university at the end of the episode, the series continues to both evolve and to remain an enjoyable off-shoot of the main Doctor Who series. This enjoyment is bound to continue for both old and new Doctor Who fans with new Doctor Matt Smith and old companion Jo Grant, played by Katy Manning, appearing in the third story of the series. Meanwhile the weekly Doctor Who Adventures magazine has now reached a remarkable 188 issues. Published by BBC Magazines and edited by Moray Laing, DWA continues to publish a comic strip featuring the Doctor and Amy and the 4 page colour strip in the current issue is written by Trevor Baxendale with art by John Ross and colours by Alan Craddock. Long standing DWA artist John Ross appeared at the second Oxfam Comics Day event in Edinburgh earlier this year (Ross centre between 2000AD/Megazine's David Bishop on the left and Gordon Rennie on the right) and is due to appear at the Cardiff International Comics Expo at the Mercure Holland House Hotel in Cardiff on Saturday 26 February 2011 along with other Doctor Who comics authors and artists. Doctor Who Adventures is published each Thursday and costs £2.20. More details are available on the title's website. The official BBC Sarah Jane Adventures website also includes this on-line comic, Return Of The Krulius. 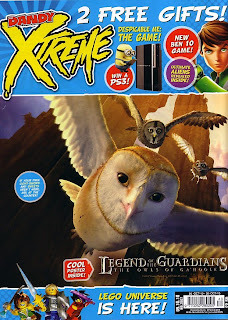 Take a long hard look at the cover of the current issue of Dandy Xtreme. Stripped of its free gifts (five chewy sweets and a small toy light sabre) there is nothing to suggest that it is a comic, let alone the longest running comic in the country. Indeed the Dandy section of the logo is so small that it almost seems like an afterthought, yet issue 3507 is the current issue a of a title that has been with us since December 1937. The bi-weekly Xtreme makeover came just over three years ago and was criticised at the time. However moves are afoot in Dandyland to pull the title back from the extreme. 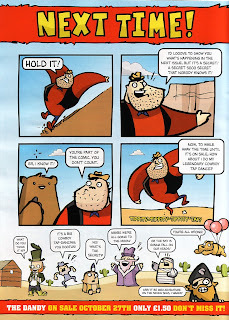 The current issue, which is dated 6-26 October and costs £2.50, sets the wheels in motion with this page of Desperate Dan telling the readers that something big is happening with the next issue, but giving nothing away. Also giving (almost) nothing away on their blogs are artists Nigel Parkinson and Lew Stringer. While Nigel illustrates Cuddles and Dimples in the current issue, Lew has not worked for the title before and is understandably proud when he says, "The Dandy was the first comic I read as a child. It helped teach me to read, so I'm very pleased and honoured to have been asked to contribute." In addition to the revamped title, the comic's website will be revamped and already there are new official Dandy Twitter and Facebook pages. This is a new departure for DC Thomson and is something of a quantum leap in the way the company promotes their comic titles. Time will tell if the children of Britain take to the new format, whatever it may be, but downthetubes wishes the editorial team and their contributors the best of luck with it. 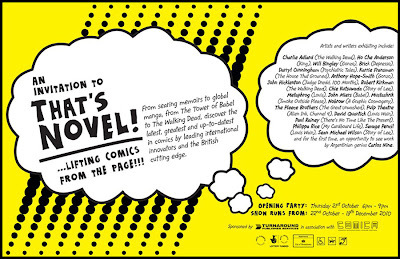 With Clint just arrived, new Dandy almost with us, Multiverse about to appear and Strip Magazine due in the new year, it is good to see that publishers are at least willing to give British comic publications a chance. Long may it continue. The first issue of the new look weekly Dandy will be on sale on Wednesday 27 October 2010 and will cost £1.50. If Beryl the Peril, Korky the Cat, Spider-Man, Desperate Dan and the Bash Street Kids are some of your favourite cartoon characters, then get along to Morecambe's Platform venue on Friday, 29th October to meet Tim Quinn, who worked on the comics that have featured these characters as a script writer. Tim worked for some of the world's most famous British comic book companies as scriptwriter, editor and illustrator. This month he's coming to Morecambe's Platform to take his audience on a hilarious and nostalgic trip through the last 150 years, screening images of the best and worst strip creations. Hear how Tim teamed up with legendary Queen guitarist Brian May to create a comic book without pictures. and find out how the daughter of Enid Blyton teamed up with the editor of Spider-Man, what the banned cover of Spider-Man looked like and how Tim survived being editor of Barbie's comic book! Plus, if you love to draw or just want to visit the world of comics and cartoons, you will have a whale of a time at Tim's cartoon workshop which takes place on the afternoon of the event starting at 2.00pm. The workshop which is suitable for all ages includes figure drawing, emotion, storytelling in pictures, character and story creation and comic book history. • The lecture is suitable for boys and girls from 9-150 and starts at 7.30pm. The audience is being invited to dress in capes and masks if they wish. Tickets cost £10. The Cartoon Workshop costs £5. Early booking for this is recommended. • Tickets for both the lecture and the workshop are available from the Platform box office - 01524 582803 or in person at Lancaster or Morecambe Visitor Information Centres. THAT’S NOVEL: lifting comics from the page is a new exhibition at londonprintstudio which opens on 22nd October 2010, featuring the work of several artists including Charlie Adlard, Ho Che Anderson, Darryl Cunningham, the late John Hicklenton, the Metaphrog team, Pulp Theatre and many more. The exhibition surveys today’s innovators in the comics medium with a special emphasis on the British-based cutting edge. Through original and digital artworks, printed books and specially-conceived projects on and off the page, this exhibition gives visitors the chance to discover where comics are going next. New directions include searingly frank autobiographics about illness and the final exit from John Hicklenton, acute social documentaries, narrative street art, craft-based and 3D storytelling, global manga, a visionary expansion of the zombie genre and sinister secrets within a gutted childhood dolls house. "The future is graphic," say the organisers. "With continuing acclaim from the worlds of literature, art, cinema and beyond, graphic novels have proved that they are truly innovative, interactive contemporary storytelling experiences through sequential art, with or without additional words. More and more are being adapted successfully to the big and small screen and attracting fresh audiences, from Scott Pilgrim to The Walking Dead." "Graphic novels, and their related forms of manga from Japan and bandes dessinées from France and Belgium, are liberating the comics medium from the confines of safe conformity and well-worn genres. Now at last it’s possible to realise the full potential of comics through fascinatingly diverse, complex, often provocative narratives, for adults and for all ages." This exhibition shows the full potential of comics through fascinatingly diverse, complex, often provocative narratives, for adults and for all ages. The exhibition is the major element of this year’s Comica, the London International Comics Festival (www.comicafestival.com) and is curated by Paul Gravett. In addition to these principal artists, a large range of original artworks by other graphic novelists will be on display. Many artists in THAT’S NOVEL will be taking part in a programme of talks, panel discussions, masterclasses and workshops invited guests from Britain and abroad. They will also be collaborating with londonprintstudio to produce special printed works related to their graphic novels for display and sale. As a result, the exhibition is as much about demonstrating and celebrating the processes of making and printing comics in innovative ways, as it is about presenting the finished artworks and their final book forms. Artists are collaborating with londonprintstudio to produce special printed works related to their graphic novels for display and sale. Football comic Striker is to have its entire 25-year archive made available to read free on its official website, striker3d.com. The library has been launched with the release of the first seven stories from 1985 to 1987 and new episodes will be added every day. 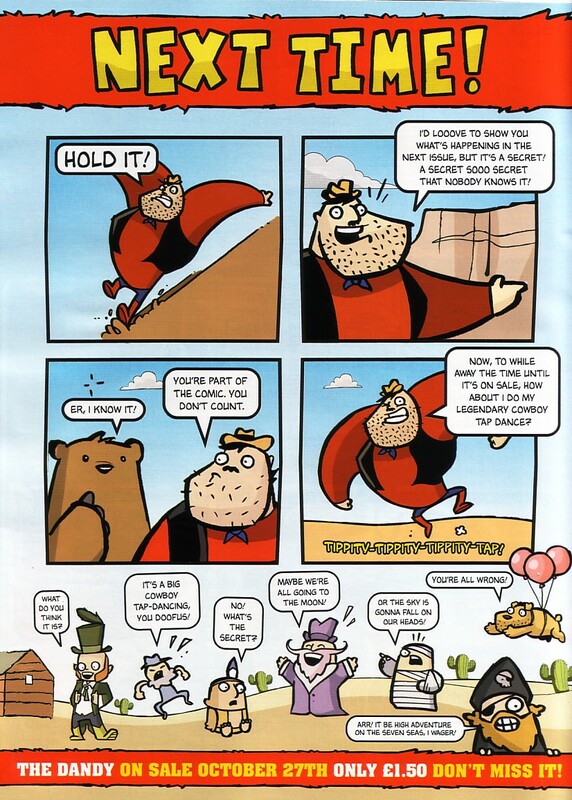 Striker appeared daily in The Sun until September, 2009 and then featured for nine months as a weekly page in lads magazine Nuts. “I want to concentrate on new writing projects." says Creator Pete Nash, "but this is a great way of keeping Striker alive for years to come. “With the exception of the first three years of strips which were printed in a 1990 book, the stories have never been republished following their appearances in The Sun. “Many of Striker’s fans have never seen these early stories and the ones who have will be able to enjoy a daily trip down Memory Lane. “My old employers at News International are putting their content behind a paywall but if I did that with Striker it would end up being pirated and there would be a smaller readership. 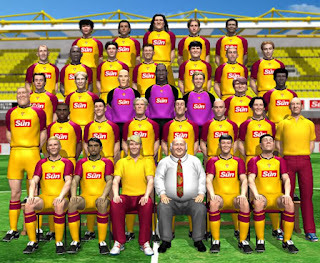 The striker3d.com website is being developed, hosted and funded by Isle of Man-based business solutions company Intelligence Ltd.
Steve Woodford, the company’s Chief Executive, said: “I had never read Striker before but I was coming across so many people saying how much they missed it after it ended in The Sun that I decided to check it out. After some teasing of comic fans last month, Multiverse - a new comics news magazine from by former Comics International editor Mike Conroy and team, which will be distributed to UK comic shops - has been announced. A 20-page sampler available to read online here (or download here, PDF link) and other places on the web. Visitors to the British International Comic Show this weekend will be able to pick up copies of a print version and the actual magazine itself is set to debut at the London MCM Expo at the end of the month (although copies may also reach BICS, too). 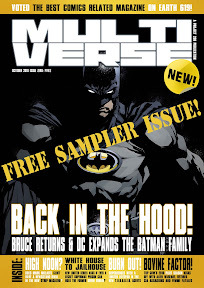 The free Zero Issue, which includes items on developments for Batman into a global franchise and Marvel's Spider-Girl will also be distributed in comic shops. Barry Renshaw, perhaps best known for his work on the new Eagle Initiative and Redeye Magazine, is also involved in the project. "I’m extremely proud of Multiverse," says Mike in his editorial. "It will be a £2.50 news magazine running to 52 pages and will plug the huge hole left on this side of the Atlantic by the demise of Comics International." Unashamedly populist each issue will offer a mix of reports, interviews and features covering all aspects of the comics industry. After the problems Comics International had, why is Mike, who came off badly from that whole debacle, taking the risk of lanching a similar title? Is he mad? Isn’t print heading the way of the dinosaur, the dodo and the great auk? kind of comics magazine that I envisage. And as for my sanity in taking this on… the jury’s out on that one! copy magazines, it’s simply a new competitor, which can coexist," he argues. "It won’t kill off publishing any more than television finished off radio or DVDs brought an end to cinema." We certainly hope Mike's right. From forum posts over on the downthetubes forum, we know a lot of people miss a title like Comics International. Let's hope Multiverse fills the gap. The Eagle Initiative has announced that its website is now open for submissions to its innovative worldwide talent search. With Stan Lee as its patron and a host of top name creators on board as judges, the Initiative – an offshoot of the long-established Eagle Awards – is offering untried talent a chance to demonstrate their abilities before a global audience. It is providing a unique platform from which the next generation of writers and artists can promote their storytelling ability in an increasingly competitive market. Launched in May 2010, the Initiative, which is the brainchild of Barry Renshaw, provides a unique platform from which the next generation of writers and artists can promote their storytelling ability in an increasingly competitive market. Entrants can be a single writer/artist, a writer and artist, or a writer, penciller and inker team. They should submit a clearly told, self contained story of between 4 and 10 pages to www.eaglesinitiative.com/Submissions where full details can be found. The thousands of expected entries will be assessed by a hand-picked jury of comics readers, which will present a final dozen to the panel of judges comprising many of the comics industry's top talents. Among those who have already agreed to participate are Tom Brevoort, Mike Carey, Howard Chaykin, Chris Claremont, Mike Deodato Jr, Steve Epting, David Finch, Geoff Johns, Denny O’Neil, Trina Robbins, Bob Shreck, Gail Simone and Roy Thomas. In addition, all 12 short listed entries will made available both digitally and in print in the form of an internationally distributed anthology. The deadline for submissions is midnight (Greenwich Mean Time) on Monday 31st January 2011. Top British comic artist Bryan Hitch will be signing his Ultimate Comic Studio at the Forbidden Planet Megastore London, on Saturday 23rd October 1 - 2.00pm. Bryan explores his inspirations, approaches and techniques through a stunning collection of his finest pieces from Marvel, as well as brand new pieces commissioned especially for this book. Packed with information, practical tips on panel composition, storytelling, tools and materials, inspiration and references, how to break into the industry and much more, this is the long awaited guide and a must-have for Bryan Hitch fans all over the world. Including a foreword by writer, director and producer of TV"s Buffy the Vampire Slayer, Joss Whedon, this is a veritable visual feast of dynamic, impactful art for comic fans all over the world. Listing the all comics credits to Bryan Hitch’s name would be impossible: from his early work at Marvel UK, his career spans titles for both Marvel and DC, working with some of the genre’s foremost writers – including Mark Millar (for The Ultimates, The Ultimates 2 and Fantastic Four) and Warren Ellis (for Stormwatch and launching The Authority). The BBC also hired Bryan as the concept artist for the 2005 relaunch of Doctor Who and he has had particular input into the redesign of the TARDIS. 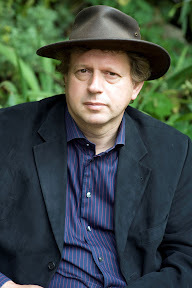 London MCM Expo organisers are delighted to announce that Peter F. Hamilton, one of the finest British sci-fi authors writing today, will be a special guest at the London’s biggest entertainment weekend held at Excel London later this month. Hamilton will be hosting a panel to discuss his work and answer audience questions, and he will also be signing books for his fans. Hamilton’s latest novel, The Evolutionary Void , concludes the highly-acclaimed Void Trilogy that has unfolded in the top 10 bestselling earlier volumes, The Dreaming Void and The Temporal Void. Noted for combining epic scale space opera with startling perspectives on tomorrow’s technological and cultural trends, Hamilton’s previous books include the Greg Mandel Series, the groundbreaking Night’s Dawn Trilogy series and the galaxy-spanning Commonwealth Saga, which is set in the same world as the Void Trilogy but thousands of years earlier. In addition, the prestigious Eagle Awards, the world’s longest running fan-voted comic book accolades – will be held on the evening of Friday 29th October. A quick reminder that Comica is to host a one-day event promoting the multi-disciplinary academic study of comics, comix, manga and bande dessinée and other forms of sequential art next month. 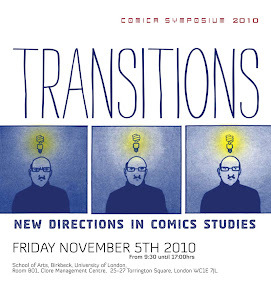 Transitions, which will take place on Friday 5th November at the Clore Management Centre in London, is a one-day symposium devoted exclusively to promoting multi-disciplinary research of comics and graphic novels, manga, bande dessinée, webcomics and other forms of sequential art. Rather than be restricted by a specific theme, the aim of the symposium is to highlight research from postgraduate research students and early career lecturers bringing together different perspectives and methodologies, whether cultural, historical, or formal, thereby mapping new trends and providing a space for dialogue and further collaboration to emerge. The speakers will be: Maggie Gray (UCL); Chris Howard (SOAS); Sarah Lightman (Glasgow); Ben Little (Middlesex); Catriona MacLeod (Glasgow); Ernesto Priego (UCL); Nicola Streeten (Lincoln); Maria Vaccarella (KCL); Sarah Zaidan (Kingston). Chairs: Dr. Will Brooker (Kingston); Paul Gravett (director of Comica); Dr. Ariel Kahn (Roehampton). Respondent: Dr. Roger Sabin (Central Saint Martins). 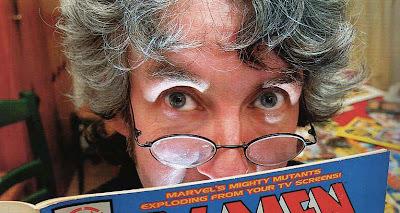 Dr. Roger Sabin, Reader in Popular Culture at Central Saint Martins and author of Adult Comics and Comics, Comix and Graphic Novels, will introduce the event and respond to the panel papers. By thinking about comics across different disciplines, the intention is to spark debate and address a wide spectrum of questions. Following the papers and response, there will be a roundtable discussion from artists/scholars who will reflect on the links between the two practices. Work will be on display in the foyer throughout the event. The day will conclude with a wine reception. Transitions is organised as the opening event of Comica 2010, the London International Comics Festival in association with Birkbeck, University of London, Studies in Comics, Journal of Graphic Novels and Comics and European Comic Art. Contact: Tony Venezia and Paul Gravett to register (a.veneziaATenglish.bbk.ac.uk and paulATpaulgravett.com).